I have just see two different solo exhibitions where the artists had very different ways of using geometric patterns in their work. At the Lu Magnus gallery Kristen Schiele has an exhibition titled “Spirit Girls”. This show is Schiele’s expression of the future world her young daughter will experience. There are layers of figurative illustrations and geometric patterning. Here is a view of the gallery wall with a series of patterned parallel boards installed in a corner. This alludes to the layers of lines and patterns in the rest of the work. What interests me about this work is the silk screen overlays and underlays of mathematical lines and shapes. They created a disjointed quality to the work. Schiele seems to be using the parallel lines, radiating lines, and star and triangle grids as a metaphor for travel into the future. In “Spirit Girls”, an acrylic painting with silkscreen the sliver of a woman’s profile is at the center of the work, with an explosion of lines radiating from behind. There are also sections of geometric patterning. To me, the use of these mathematical patterns express the non-linear nature of Schiele’s projected future society. This is an excellent example of the use of mathematical forms being used to make art about sociology. 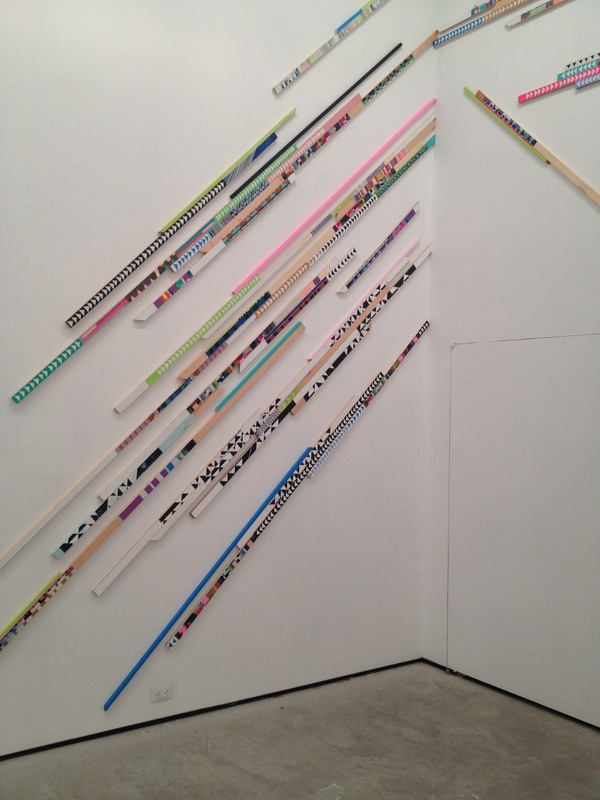 Artist Amanda Valdez incorporates geometry into her work as a connection to Art History. At the Denny Gallery, Valdez is exhibiting paintings in her solo show titled “Thick as Thieves”, that incorporate quilt elements. These pieced fabric sections relate to the Bauhaus workshops, Islamic design, as well as traditional quilts. 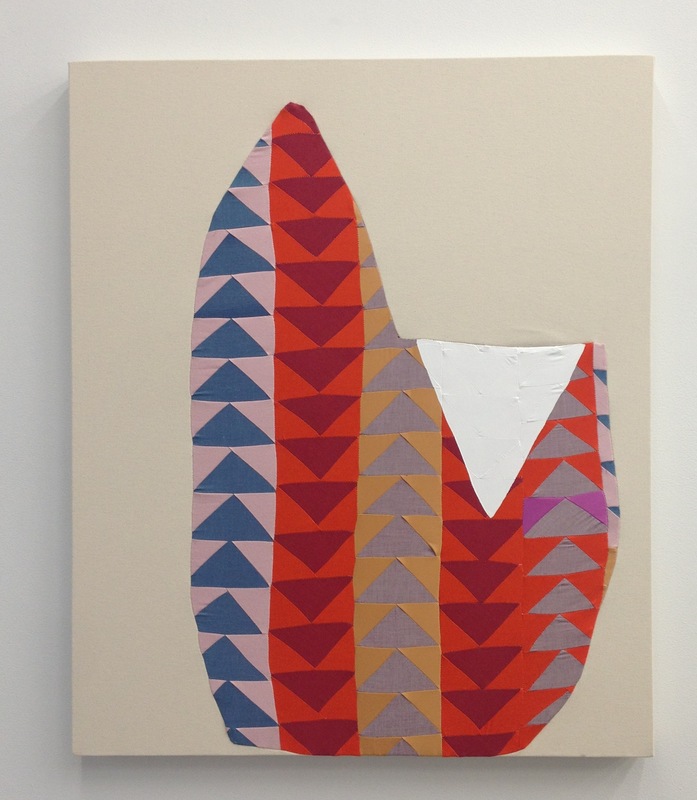 In the work “Wild Goose Chase” 2014, fabric and gesso on canvas, there is a large central shape made out of fabric columns of isosceles triangles. The direction of the triangles’ points and bases alternate from one column to the next, creating a glide reflection symmetry. There are horizontal lines of reflection and then a horizontal translation. 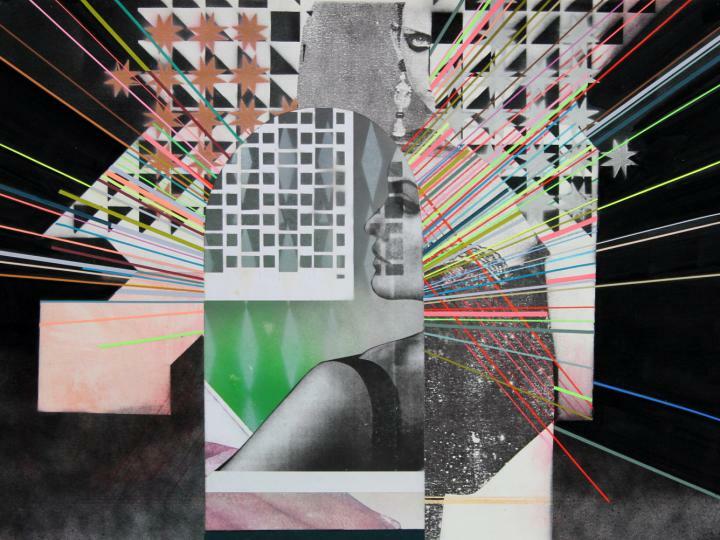 Both Kristen Schiele and Amanda Valdez use geometric patterns in their work. Schiele”s work is inspired by the future, while Valdez has plumbed a wide scope of artistic traditions to connect with the present.